DRUMROLL PLEASE...meet the 2016-2017 mambi Design Team !!! Allow us to introduce the twenty (!!!) ladies who make up the 2016-2017 me & my BIG ideas Design Team! You might notice some familiar faces returning for another round of mambi designing, but most of the team is here for the first time. Truth be told: THIS WAS THE HARDEST ROUND of choosing for the mambi Design Team we've ever encountered! Hundreds of you planner babes and master crafters applied for the team, and there was so much talent to decide between. We are incredibly grateful for your enthusiasm and the time you took to share your work with us. In the end, we comprised the team of women from all walks of life, who do an amazing job of advocating for our brand - all on their own accord - and have been doing so even before the open call went live. With this new team and this new Design Team cycle, we hope to bring you mass amounts of inspiration for every creative adventure you might embark on. Whether it's Happy Planner™ pages, scrapbook layouts, card-making, modern day memory keeping, mini books, art journalling, home decor, DIY gifting, party planning, or JUST PLAIN PLAY, mambi wants to you to live creatively. Most importantly, we hope to continue to build The Happy Planner™ community through conversation, inclusion, support, positivity, and friendship. These 20 ladies are here to inspire you, inform you, and keep you in the loop! Below are links to where to find each of them, so you can drop in to say 'hello' and get a sneak of what they have to offer. Here's to an awesome year! Cheers! The mambi Design Team CALL is now OPEN and very active! You can view the original post on it HERE. The submissions so far have all been pretty impressive and I don't know how we're going to narrow it down. Like, really. There are some talented planners & crafters out there. Oh no! I accidentally submitted my entry form without all the information! Should I complete a another form? Yes! Submit a new form with just your name and the info you missed...it will show up right after your first entry, so no need to repeat information. How long is one expected to be a member of the me & my BIG ideas Design Team? The Design Team runs for a whole year so October 1st 2016 - September 30th 2017. How many people are going to be picked for the Design Team? Same as last year? Last year's Design Team was 15 members-strong; this year we're goaling for 10-15. Is the Design Team call open to us digital scrappers too? Unfortunely no. At this point in time, mambi does not offer any digital versions of our product, so there would be none available for all you fabulous digital scrappers to use. This is definitely something we will be looking into. Is the Design Team call open to internationals? We encourage everyone from anywhere to enter, however - based on how much it costs to ship product internationally, we prefer USA applicants. Please note his does not necessarily disqualify our international applicants. To apply for the Design Team, it asks me to submit 4 to 6 projects. None of my projects contain mambi product. Will that be a problem? There is no need to force you to create something using mambi product if you haven't already done so, just be aware that if you make the team, you'll be required to use only/mostly mambi products in your projects. For the OPEN CALL submission, just submit any crafting that you're proud of. The team here at mambi needs to get a feel for your style and skill set. You mentioned that the selected team members are required to submit two+ projects each month. Does this mean they will need to ship the actual projects to you or will they just take a photo of them? The two+ projects per month would get to me via photos you've already taken of the projects. You most often won't be mailing me any of your actual work, but if the situation arrises where we'd want the actual project for a trade show or something, we would ask for your permission and pay you for it. The two monthly blog / social media posts - Is this on the mambi blog? Would we need to write up the content for mambi blog, or is it okay to just post to our own blog/social media? The two monthly blog / social media posts would handled by you the exact same way you already post projects on your blog / IG accounts. This part about your project sharing would not change...just an extra link to us in the blog post or an extra "@meandmybigideas" or "@the_happy_planner" in the IG post. We would take care of the project's presence here on the mambi blog, and link to your post on the project and send traffic your way. What do you mean by 'active mambi promotion'? By 'active mambi promotion' we mean regularly using our product on your projects in a way that will inspire others to want to use them too. Then you'd either link the product(s) you used to its location in our online shop, or promote us by linking to our blog. I hope this post filled in some of the blanks from the original Design Team OPEN CALL post. If there are still questions or concerns, feel free to send them in an e-mail to amanda@meandmybigideas.com for a prompt response. Thanks, and good luck to all! mambi 2016-2017 Design Team OPEN CALL !!! 2016-2017 mambi Design Team OPEN CALL is here! We are looking for happy people who, like us, live creatively! 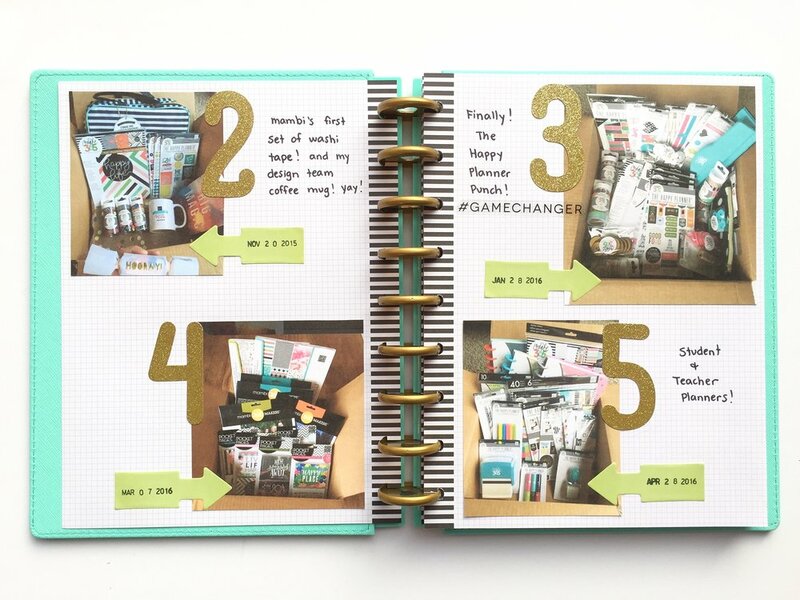 Do you love to plan & create & craft with me & my BIG ideas products? If so, we encourage you to apply for our mambi Design Team by filling out the form below. Include where you live, your crafting favorites, and why you'd make a good member of the mambi Design Team. We encourage you to have used mambi product, but it is not a requirement. Make sure your projects are well lit, and best show your individual style. Thank you for your submission! You have successfully applied to be a member of the 2016-2017 mambi Design Team! The members of the mambi Design Team are a group of creative planner addicts who come up with innovative and inspiring ways to use The Happy Planner™ and appeal to the enthusiastic planner community. 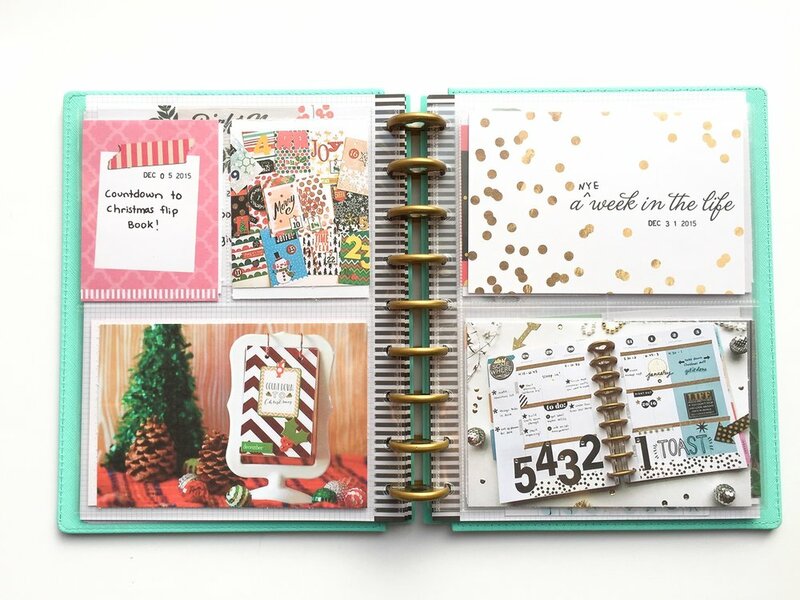 The Design Team is also expected to stay on trend with modern day memory keeping in the form of scrapbook layouts, POCKET PAGES™/pocket scrapbooking pages, cards, mini albums, banners, etc. AND come up with ways to use mambi product for home decor styling, party planning, holiday decorating, and the like. You will be supplied with awesome me & my BIG ideas goodies to play and create with. You will be informed of & get access to new product before the general public. You will receive exposure through the mambi blog & our other social media sites. You will be a part of a positive community of like-minded creatives. You will be active in the sharing of creativity and inspiration. Use me & my BIG ideas products in your projects & link to our site whenever possible. Actively promote mambi products. This included social media participation. Post regularly, as well as participate in cross promotions whenever possible. Submit a minimum of 2 projects each month. Post a minimum of 2 blog/social media posts linking to mambi per month. Link to mambi blog on your blog or website. Follow @meandmybigideas and @the_happy_planner on Instagram. Follow the mambi Facebook page. October 1st, 2016 to September 30, 2017. Spread the word to all your creative friends! LAST DAY FOR SUBMISSIONS will be Sunday, September 11th. will be announced on Friday, September 16th. Welcome to the new 2016-2017 Happy Planner™ BLOG HOP featuring posts by the me & my BIG ideas Design Team! The idea behind this BLOG HOP is to give you an in-depth look of some of the 10 new Happy Planners™ that are going to be available on the mambi shop March 1st @ 8am PST, and to give you 16 unique perspectives on why and how those certain Happy Planners™ landed on the desks of the members of our team. HOW THIS BLOG HOP WORKS: at the end of each blog post in the HOP will be a link to another member's post on their plans for Happy Planning™ come July 2016. You will keep 'hopping' to the next blog until you wind up right back here where you started. 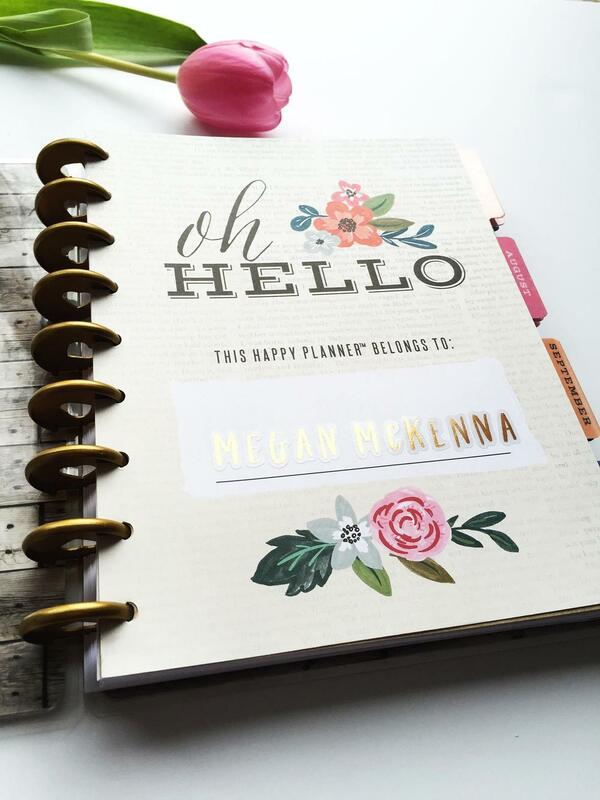 Now, without further ado, we'll kick it off with our first participating Design Team member Megan McKenna and her new 'Fresh Floral' Happy Planner™. I’m excited to show you the style of my new ‘Fresh Floral’ Happy Planner™ and share how I plan to use it come July. When I was told to choose which one out of the 10 new planners I was going to use, it literally took me a while. Each planner has its own personality and style to it which makes it so hard to just choose ONE! 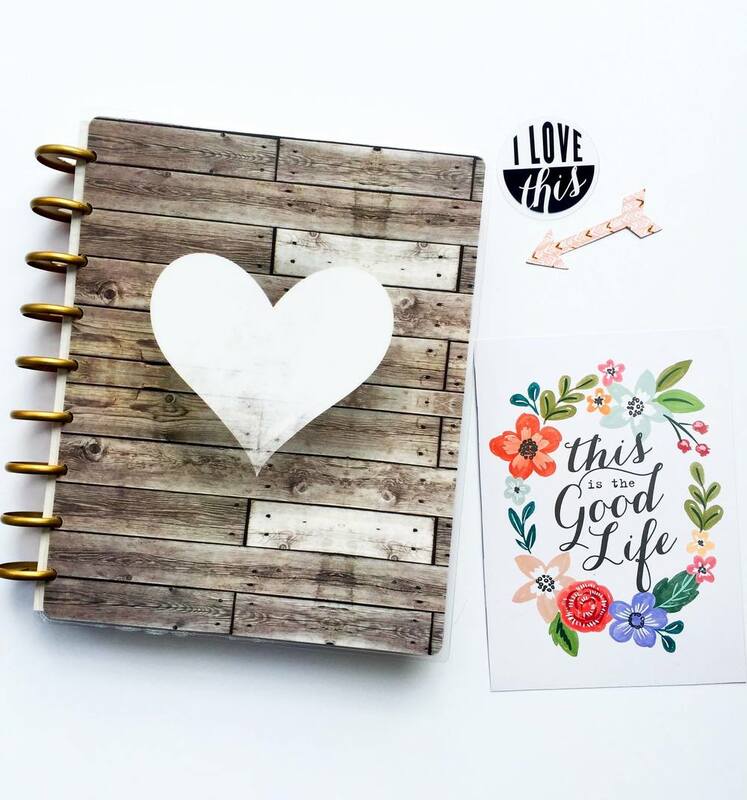 The reason I chose the Fresh Floral planner was because of a couple reasons that I am going to explain in this blog post. You should never judge a book by its cover, but in this case the cover played a giant part in my choosing. Not only does it come with this beautiful almost-watercolor floral pattern, if you flip it over, it has a fabulous woodgrain pattern. Florals and wood grain?! SOLD! What a perfect combination! The only bad part about that is - choosing which one to be the cover in July! I had the above Savannah DIY Gallery Art Pad at home, but didn't realize that my new planner matched perfectly with it! I finally noticed, and now I can have my craft room match my planner! How fun! This rustic theme is so beautiful with the script fonts, floral, wood grain, and the foil details. It reminds me of being back home at mom's house in the middle of the country! I think that's why this planner spoke to me. I love that the Happy Planners have a first "hello" page. It's like your planner is welcoming you back for more planning! As you open up to the first page, you start to notice the color scheme of purples, peach, oranges, and pinks with black lettering. I felt like a pop of gold would finish off this front page so I added my name using the gold foil alphas & words mambiSTICKS pack. Perfect touch, don'tcha think? This page is one of my favorites in this planner. It has a "currently" section where you can write down what your reading, what your crafting, where your going? So you can look back and see how you changed throughout the year. It also has a spot to list the birthday and important dates occurring that month along with your goals. I just love the script font used on this page. When the month is over I might go back and add a pocket page in front of the divider and insert a few photos from that month! As I was flipping through this planner and I reached a monthly spread, that script sang to me. It is so clean and pretty. I really like that the view of the month has simple colors and isn't too busy. I usually put birthdays, appointments, special events, photo shoots, and fun 'National Holidays' on this spread, then when this month comes I will go to the weeks and plug in all the info. One element that I wish this planner had but the 'Be Bright' planner has, is the fun 'National Holidays' already written in the month. I think this is such a fun way to have extra things to celebrate for! The beginning of every year I make my list of the days that I want to make sure that I do something for that specific day, such as making a pizza on National Pizza Day! The very top reason I chose this planner is because of the way the weekly spread looks like. I like layouts that are very clean and simple so when I want to add my own details such as washi tape, stickers or color combinations, it won't look too messy. I like that the numbers and days of the weeks at the top are black and in a simple font. I also like that the weekend boxes have a shaded color to them so the weekend plans stick out. I like that the 'morning, afternoon, evening' text is removed because I don't necessarily plan that way. I use the top box to write my work schedule, any birthdays or appointments, and holidays. This is the first box I look at so this is for all the important information. The second box I use for my To-Dos. I list all the tasks I need to get done that day here. The bottom box is for either more tasks, a fun motivational sticker or quote, or things I have to do that day but isn't as important. I really like celebrating for holidays such as Christmas or Halloween in my planner by decorating with stickers and washi tape but this planner isn't really set up, color wise, for holidays. I loved the simplicity of the inner pages so much so I had to give that up. With the pages being so clean and simple though, I don't see it being a problem for me when I go in and add my decorations. The overall style and feel of this planner, if you didn't already notice by the amount of times I used the words 'clean' and 'simple', IS clean and simple. But the floral detailing makes it elegant and beautiful. Thanks so much for stopping by! 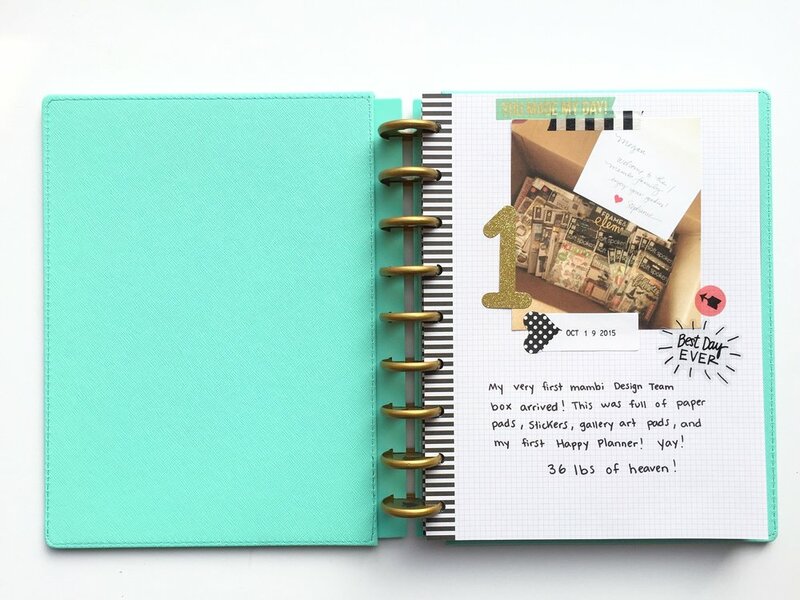 Keep the HOP going by heading over to mambi Design Team member Thuy Bui's blog at >> http://www.heythuy.com << to see which Happy Planner™ she's got her hands on! 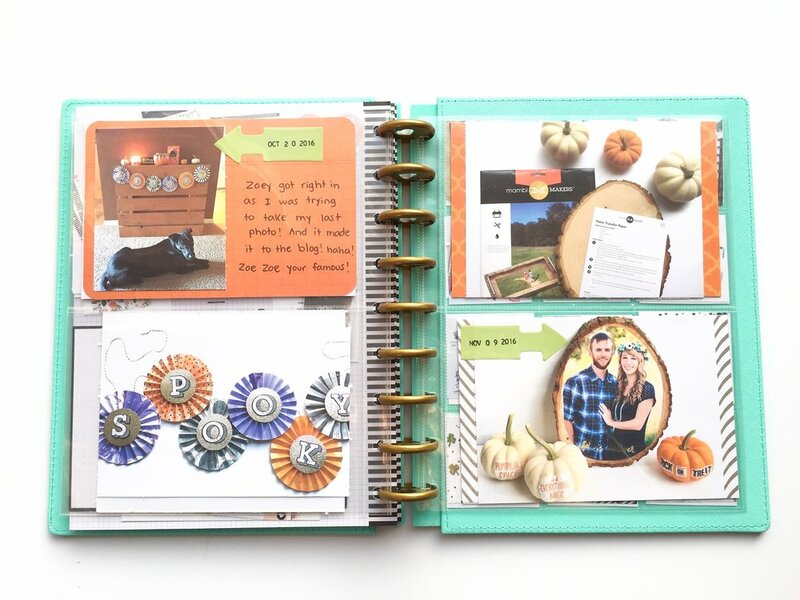 It's November, and today we're sharing this November prep page from The Happy Planner™ of mambi Design Team member Jennie McGarvey. Jennie included a lot of great details on this page, but the one that stands out the most to us: her reminder in the 'Don't Forget' section to start shopping for Christmas!!! "At the beginning of each month there is a page that gives you an overview of the month. It's a beautiful way to remember special dates, things that are important, or activities you have coming up. I love to change mine up each month depending on what I have going on - and no two months are ever the same. I can embellish based on my current style (which changes all of the time) and I go with what feels right! This month, the 'Important Dates' and 'November Goals' section didn't feel too important to me so I decided to simply embellish. As far as November birthdays go, one of my sons will celebrate and so will his best friend. YAY! What a better way to celebrate than to dress up this section with embellishments & number stickers to mark the dates?! I could probably add 14+ items in the 'Don't Forget' section, as I'm always forgetting things. However, I decided to pick one super important thing this month and run with it! Some months, this section is a fun place in your Happy Planner™ to highlight that one thing you really want to accomplish." Shop the supplies Jennie used for this page by clicking on the items below. NOTE: The top three stickers Jennie used are from new products that are not yet listed in the shop. monthly Prep pages, click HERE. Whether it's for a friend, a grandparent, your child's teacher, or someone special, a handmade card to go with a bag of Halloween candy makes a long-lasting impact on the receiver. Today we're sharing a few different paper crafts created by mambi Design Team members Jen Randall, Heather Adams, and Megan McKenna that they have made ready to give out for Halloween. "I love making special Halloween goodie bags for close friends, neighbors & cousins. 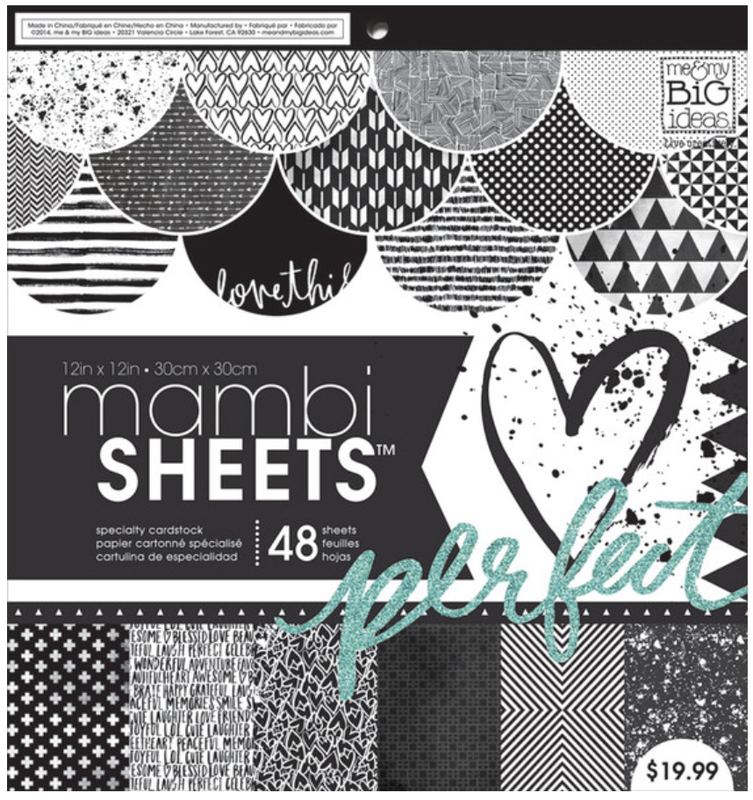 The all Black & White Trendy 12x12 mambiSHEETS paper pad is perfect for this kind of project. It was what I grabbed for first and acted as inspiration. I choose some of the patterned paper and paired it with some super fun SOFT SPOKEN™ Halloween stickers which helped bring it all together so easily! Now all I have to do is fill them up with candy & deliver them. I think adding a little extra 'love' to packaging always makes the recipient feel special. Pretty paper, stickers & embellishments always makes the process not only fun, but a lot easier." Shop supplies Jen used by clicking on the images below. "I am obsessed with making shaker pockets. So far, I have shared how to make a shaker pocket in your POCKET PAGES™ and how to make a shaker card with a clear page protector. Now it's time for using vellum to make a subtle shaker accent for a halloween goodie bag! To make this shaker pocket, I folded a piece of vellum and filled the inside of the pocket with sequins and card stock pieces that I had taken the dimensional adhesive off of. After I filled the pocket, I glued the sides of the pocket together with a glue runner. Then I added the glitter frame that I cut from one of the glittery POCKET PAGES™ cards from the Today Was a Good Day Specialty Card Set. Last I added some dimensional stickers to top it off. I clipped another card onto the goodie bag along with the shaker accent. I added a little bit of halloween flair to the card by watercoloring some of the white dots orange. I like the overall opacity of the vellum shaker pocket paired with the glassine treat bag." Shop supplies Heather used by clicking on the images below. "I am a very big card maker and I love creating cards for every holiday and occasion! 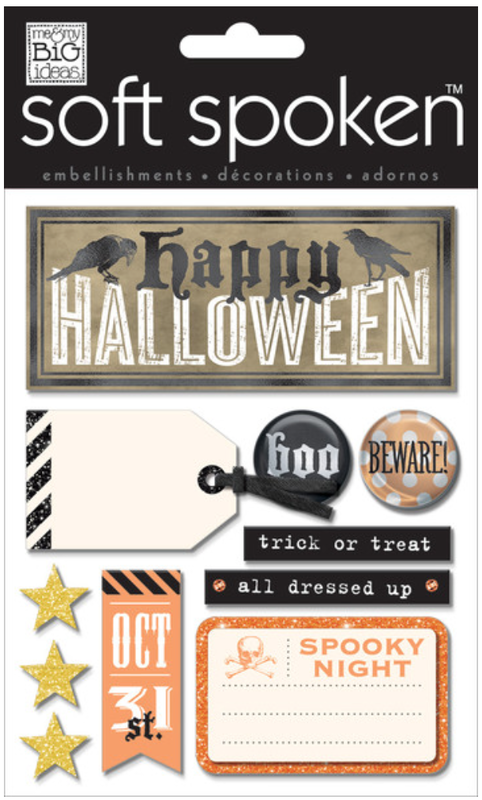 When I saw these speech bubble die cuts, and thought of Halloween being right around the corner, I instantly thought to put 'BOO' in all of them and create a card. When choosing the paper for the background, I wanted something that wasn't too spooky, but had a Halloween-ish feel to it. This purple watercolor sheet was perfect for the job! Now it's time to send it off to a 'spooktacular' friend." Shop supplies Megan used by clicking on the images below. For more Halloween ideas, head over to our Halloween Gallery page. We're also on Periscope: @meandmybigideas, and tomorrow at 2PM Pacific Time, join Stephanie Fleming LIVE! 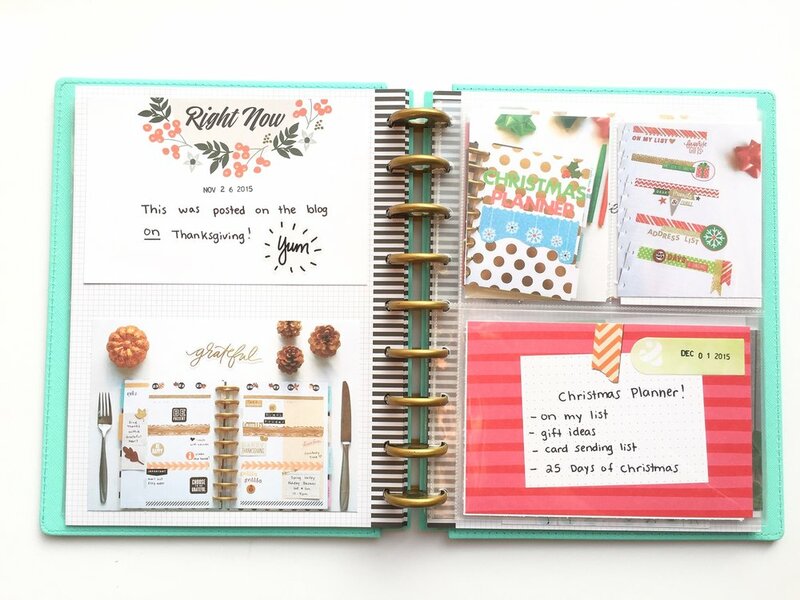 on Periscope for detailed looks at the new products coming to The Happy Planner™ line on November 14th. See you there! Friday the 13th! ...whoops! We mean Tuesday the 13th, but still: take a look at this spooky October monthly spread by mambi Design Team member Mary-Ann Maldonado! The Fall color scheme and the perfectly placed Halloween accents make us picture Mary-Ann dancing to Thriller while ticking items off of her checklists! "The time of year is my favorite. Mostly because the new Design Team was announced and my name was on it! I am thrilled to be here again. It is also my favorite time of year because I love October and November equally. 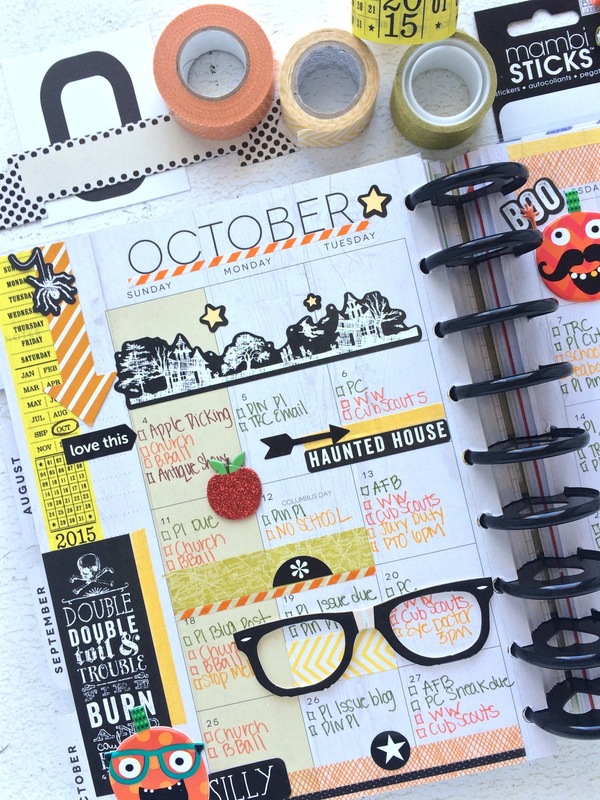 For the October monthly section of my Happy Planner™, I decided to go ALL OUT Halloween! I grabbed all the goodies I could find from mambi that would be perfect for my idea. I grabbed coordinating washi tapes and pens and started documenting. I'm particularly fond of the glittery apple to indicate our apple picking adventure and the big, perfectly too large glasses for my boy's eye appointment. Did you notice the fun pumpkin fellas? I think they were the icing on the cake or the caramel on the apple! I'm not going to lie: this is a busy busy month. I will document all the smaller details that need attention on the daily sections in the up coming week. Stay tuned!" See more Halloween-themed mambi projects by visiting our Halloween Gallery page.